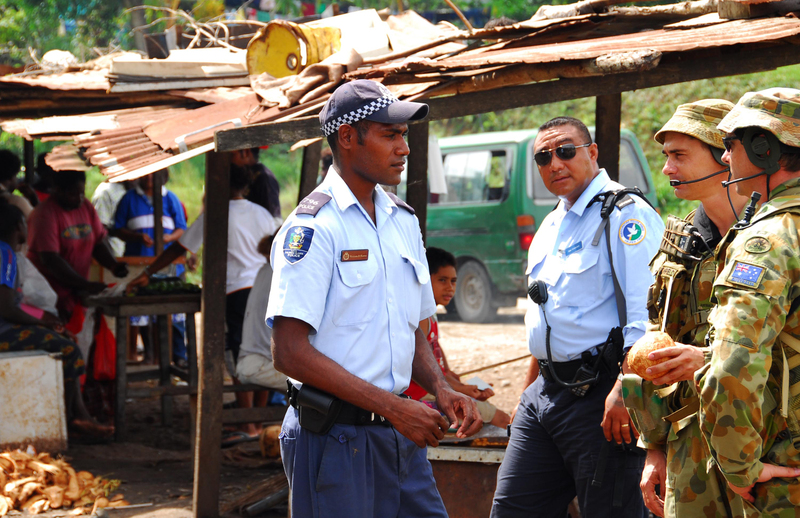 The Regional Assistance Mission to Solomon Islands (RAMSI)—an extensive (and expensive) Australian-led state-building intervention under the auspices of the Pacific Islands Forum (PIF)—has been operating in Solomon Islands since July 2003. It’s about to undergo a significant transition in its structure. As such, it’s an appropriate time to take stock of the mission’s achievements and failings to date, and perhaps more importantly, evaluate Solomon Islands’ prospects in a post-RAMSI future. In October, RAMSI’s Special Coordinator Nicholas Coppel revealed plans for the transition—the most significant since the mission’s inception. Coppel announced that from 1 July 2013 RAMSI would become a compact police capacity-building operation. Its military contingent will be sent home and its governance programs will be integrated into the bilateral development assistance programs of participating countries, mainly Australia and New Zealand. Crucially, Coppel claimed that these changes were warranted because of the progress made by Solomon Islands since RAMSI’s deployment. This is consistent with RAMSI’s ‘exit strategy’, as defined in the 2009 partnership framework (PDF) signed between the Solomon Islands government, RAMSI and the PIF. In the agreement, RAMSI’s exit is not focused on a date, but is conditioned upon the attainment of particular performance benchmarks, set out in the document. RAMSI is often viewed by international and domestic observers as one of the most successful state-building interventions. For example, the Organisation for Economic Co-operation and Development’s influential Development Assistance Committee described its security system reform approach as ‘good practice’ (PDF). Since RAMSI’s arrival, the Solomon Islands has consistently been one of the fastest growing countries in the Pacific Islands region. RAMSI has also, with the exception of the April 2006 riots, been successful in improving the security of individuals and communities. Very soon after its initial deployment, RAMSI police forces managed to seize large amounts of firearms (PDF) and arrest and eventually prosecute thousands of ex-militants who were involved in the ‘tensions’ prior to RAMSI’s arrival. This success is demonstrated each year by the very high levels of support accorded to RAMSI in the People’s Survey. A closer inspection, however, raises important questions regarding the sustainability of these achievements. The Solomon Islands economy and its government’s revenue are heavily dependent on the logging sector. Logging is incredibly important politically in the Solomons, in that it provides the rents that enable the formation of political coalitions. Politicians with logging industry connections are typically able to dominate politics, with common perception that this is due to them paying off a sufficient number of parliamentarians to support them (PDF). Since RAMSI’s arrival, the reliance of government on logging has only increased, from about 50% of export revenue in 1994 to around 70% today. 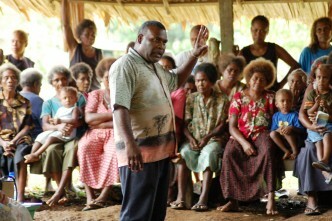 In 2011, the Solomon Islands economy grew by more than 10%, but the logging sector grew by over 12%. In fact, under RAMSI’s watch, logging volumes have reached a peak of more than double that of the logging boom of the 1990s, and are now about six to seven times the estimated sustainable yield (PDF). RAMSI’s role has been defined as one of helping the creation of conditions conducive to private sector investment in Solomon Islands. As such, it has not involved itself in attempting to expand the economic base. Instead, RAMSI’s programs have focused on reducing ‘red tape’ for investment, limiting corruption in government and the bureaucracy and helping the government collect revenue more effectively. The combination of a better legal and regulatory environment with improvements in the security situation has indeed been conducive to foreign investment and growth. But, unsurprisingly, investment went almost exclusively into the unsustainable logging sector and the equally unsustainable services sector in Honiara, which caters for the numerous well-paid consultants now residing in the Solomons’ capital because of RAMSI. It’s estimated that commercial logging stocks would be largely depleted by 2015, leaving a gaping hole in government finances that the fledgling mining sector is unlikely to fill in the foreseeable future. But even if mining operations in Solomon Islands grow rapidly, the distribution of mining rents would be far narrower than that of logging rents. This would likely upset the delicate balancing act that is coalition-building in Solomon Islands. This is the key point. RAMSI’s achievements to date rest primarily on the fact that it has permitted—even unintentionally aided—the expansion of the logging industry, therefore receiving the support of logging-backed politicians. It’s questionable whether the current appearance of calm would be maintained following the logging industry’s demise and RAMSI’s exit. Shahar Hameiri is an Australian Research Council postdoctoral fellow and senior lecturer in International Politics at the Asia Research Centre, Murdoch University. Image courtesy of Department of Defence. Is Australia still threatened by weak South Pacific states?